Athletes need protein—it’s a must. According to a recent article from Runner’s World, athletes can expect fatigue, loss of muscle mass, and heightened risk of injury when protein consumption is low. (The article recommends 0.55 to 0.77 grams per lb of body weight, meaning a 130-pound person should eat 72 to 100 grams of protein a day.) Meat is often the first protein people consider, but studies confirm it’s not necessarily the best option. So, why not try something new? 1. Blue-green Algae: Forget steak, eggs, or even tofu, you can get your protein from algae. ENERGYbits has hit the fitness scene with tiny little bits made of spirulina, a blue-green algae. The bits contain a complete protein with the algae, glucose, and nitric oxide. The company claims that these three ingredients can provide an athlete with the rapid access to glucose and protein for top performance. Additionally, the bits claim to give the body an energy boost that many have to use caffeine or chemicals to achieve. ENERGYbits’ protein concentration is at 60% which is very hard to find in most protein sources. 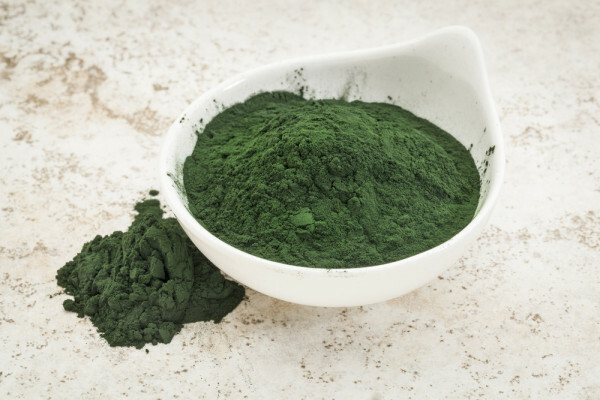 A lot of research states that spirulina contains the highest concentration of protein in the world. Oil Pulling: Is it Legit? Surely you’ve all heard about oil pulling by now, right? It’s the latest natural health trend that has blown up over the last several weeks. You’ve probably seen the images all over Facebook as so many have been experimenting with this seemingly odd practice of swishing cooking oil in the mouth to improve a myriad of symptoms. The technique is ancient, but does that mean it’s effective? For starters, oil pulling is a simple procedure. You choose a vegetable based oil, like coconut, sesame, sunflower, or olive oil, you take anywhere from a teaspoon to a tablespoon, put it in your mouth and swish it around for up to 20 minutes. The practice of oil pulling is believed to be about 3,000 to 5,000 years old. The technique falls under the blanket of Ayurvedic medicine, referring to ancient Indian medicine created in India. It’s February, that special time of year where everything is colored red and love is in the air. 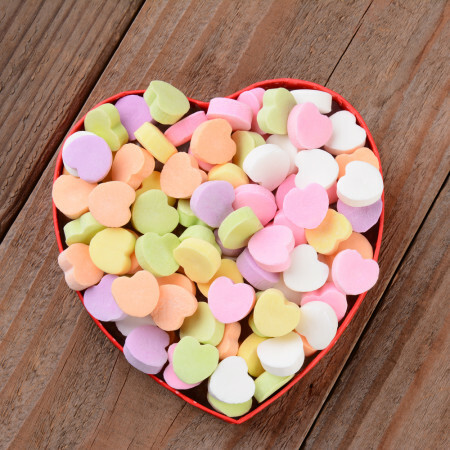 Valentine’s Day makes us all focus on our hearts a bit more, but instead of buying another bag of heart-shaped candies why not focus on your literal heart and the ways you can improve your heart health and the heart health of those around you? Here are five ways to be good your heart and to the hearts of those you love. Kickstarter is really making big things happen in the world. In 2019 the company and individual funders were responsible for the successful launch of 19,911 projects. These projects ranged from movie productions, to tech devices, to even launching a human-powered powered helicopter. In a nutshell, the platform of Kickstarter and crowd funding has proven to be very powerful. The Personal Chef is hoping to get enough pledges to become our next great kitchen appliance. 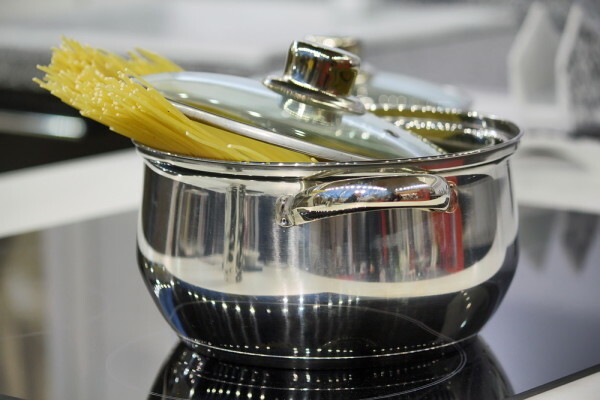 The device is designed to cook and stir. By mechanically stirring, the appliance stands to simplify the kitchen duties, therefore making it more convenient to eat healthier food at home. The Personal Chef has its own cookbook which include recipes like granola bars, fajitas, scrambled eggs, tons of soups, several stir-fry options. These are typically pretty time consuming meals as they require a lot of attention. The Personal Chef may be the device you need to stick to you resolution of eating better and eating out less. This project has not yet met all of it’s backers. Are you having a caveman holiday? 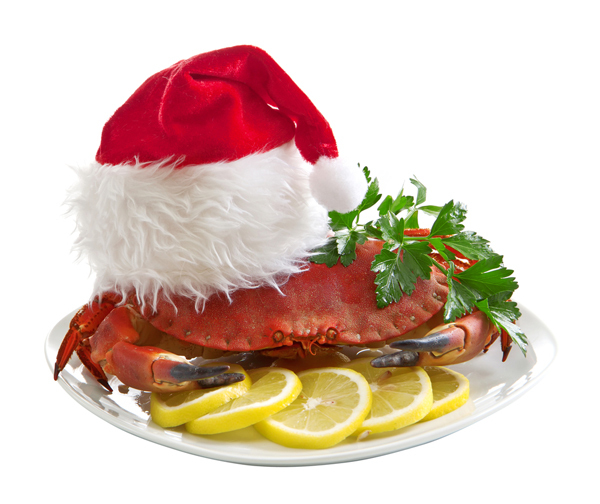 Meaning, are you on the paleo diet and plan to stick to it through Christmas? Don’t fear. You can do it without missing out on all the favorite flavors of the season. The task of eating on the paleo diet may seem daunting when it comes to traditional holiday fare. This is especially true given some of the big no-nos on the diet are grains, flour, dairy, and refined sugar. But really, it can be done and by the looks of the recipes, it doesn’t look like you’ll be missing much. The staples of a paleo diet are meats, eggs, fish, vegetables, fruits, and nuts and seeds. So if you were to look at a traditional holiday meal, the main course is often meat. Whether it be a turkey, a roast, or a ham, this part isn’t too tricky. Many recipes call for the meat to be cooked with savory herbs and spices and a few tweaks like honey and cider vinegar. Nothing too difficult. 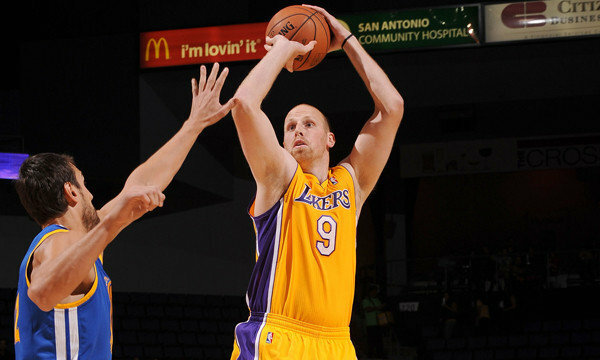 These are the word of Chris Kamen, Los Angeles Lakers player, referring to how nearly 90 percent of NBA players do not eat properly or care about their bodies. Kamen’s thoughts, along with many other NBA players’, were captured by NBA reporter Ken Berger in a three-part series running on CBS Sports this week. The first article in the series, titled Nutrition in the NBA: Part 1: Lessons Learned in L.A. Help Howard’s Career, closely follows Dwight Howard, former Laker now a Houston Rocket, and many of his former teammates as they undergo a major diet overhaul at the advisement of Dr. Cate Shanahan. When Elizabeth Candela was 17, she had a friend who was trying to get fit as he entered the Marines. He asked her to run a mile with him. She couldn’t do it. 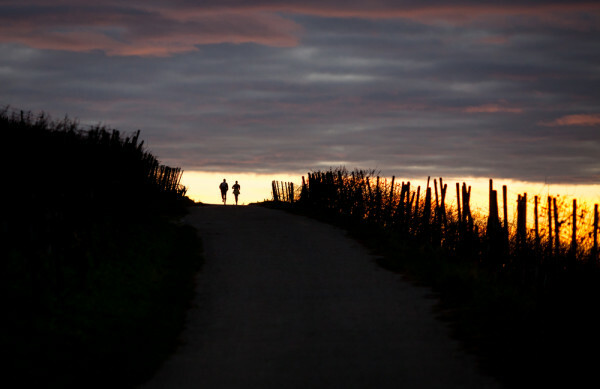 That made her mad and from that day forward, she committed to being a runner. She’s a determined runner who continues to overcome obstacles; some so huge most of us would have thrown in the towel a very long time ago. After that first attempted mile, Candela ran for health and to stay in shape; nothing too serious. In 2001, she explains that running’s role in her life evolved, dramatically. Candela’s husband was one of the victims in the September 11, 2001 terrorist attacks. He and nearly 3,000 others were unable to escape the World Trade Center that awful day. Candela needed running to help her deal with the pain. Additionally, she needed an outlet to manage the stress of raising two children as an only parent. In 2019, Candela was diagnosed with Crohn’s Disease. Now, more than ever, she had to focus on her health. She explains that she was determined to stay healthy for her family, something that motivated her to go back to school and study Nutrition and Exercise Physiology. 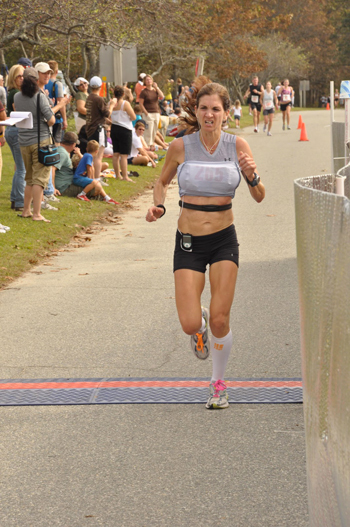 Currently this amazing runner has her American College of Sports Medicine Health Fitness Specialist Certification and is in the process of getting her American Dietetics Association Registered Dietitian’s License. Sometimes the passions that drive our lives just sneak up on us like a happy accident. For Abby Bales, running started early. By the 5th grade she was running short track distances. 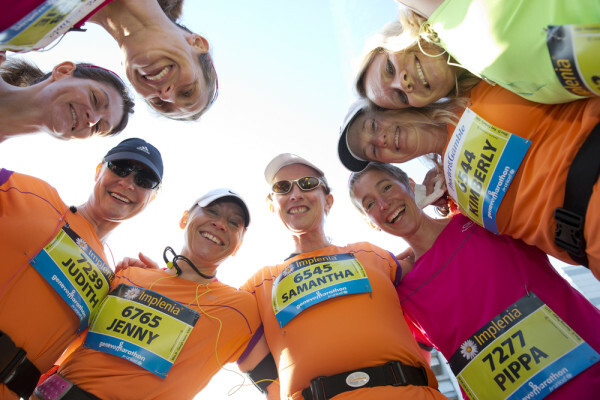 One year later her long distance running career started on a whim. As Bales was preparing for volleyball tryouts the next morning, a friend called and asked if she’d be interested in trying out for cross country instead. That phone call directed Bales into the sport she still loves today. While starting was easy for this natural talent, continuing has presented its challenges. However, what most of us would call a challenge, Bales has made look like a walk in the park. From the sixth grade cross country team all the way through high school, Bales has run competitively. 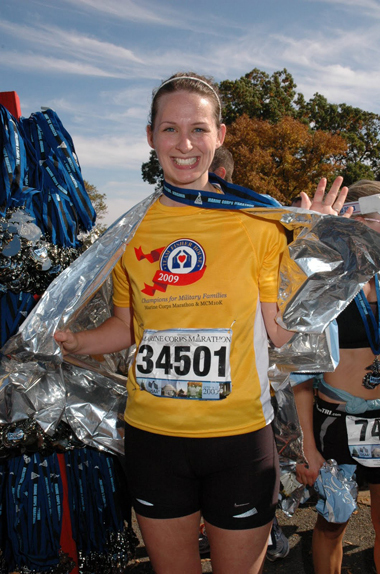 She completed her first marathon, the 2003 New York City Marathon, as a way to stay fit after graduating from college. She continued to rack up marathon finishes over the years until her first real hurdle appeared in 2019, when a diagnosis for ulcerative colitis “quickly became very serious and debilitating.” Bales stated that her running suffered, even though she managed to complete two marathons during flare-ups of her condition. Bales was not responding to medication and got very sick. By 2019 she had her colon removed and replaced with a temporary colostomy bag for five months. Despite this huge obstacle, training commenced. “It was really, really hard to start training again because my muscles were so atrophied and depleted after the surgery. It was a major surgery and my organs leached amino acids from my muscles to heal, which meant I had zero muscles left. It had never been that hard for me to run ever in my life,” said Bales.